Have you ever found a bump or lump on your horse’s body and wondered exactly what is going on? If you’ve seen bumps or lumps on your horse’s chest, ribs, flanks, or haunches, chances are it is nothing to worry about. 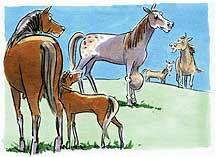 In fact, it is quite common for horses to have large, soft lumps on their body. You will want to keep an eye on any lumps or bumps you’ve found to ensure they are not anything more than a small injury. One of the most common ways a horse can get a lump on their body is from hitting or slightly injuring themselves. As unusual as this may sound, many horses will hit or try to kick themselves because of annoying flies. Horses will utilize their animal instinct, only worrying about getting the fly away. They rarely think of the consequences of hitting themselves. Another reason a horse might have a lump or a bump is because their caretaker might not be taking care of them well. If the caretaker turns the animal too sharply when they are putting them into the barn, the horse can bump their shoulders or hips on the wall. You must be very careful to avoid this, as it can really cause pain to the horse. If you are dealing with a bump or lump that is a result of kicking or the horse being bumped into a stall, there are certain characteristics the bump will have. The bump could be rather large, but don’t let that aspect scare you. At first, the lump is filled with fluid and may look like a water blister under the skin. Sometimes the skin will be broken and if you touch the area, it often feels warm. If there is a broken blood vessel under the skin, the horse may be suffering from a hemotoma. They can be quite large and won’t go down until there is enough pressure at the site for the blood vessel to stop draining. Many will go away without treatment, however, you should have vet check them out to be sure nothing else is going on with the horse. It should be noted that it can take a month or more for the hematoma to disappear completely. If you do notice a bump or lump, you need to take proper first aid measures. Apply pressure to the area that is injured, if possible. You can wrap the area if it is in a location that allows you to do so. Another treatment option is to use a cold water hose or an ice pack on the area. You should apply the cold compress for 15 minutes, and then rest the area for an hour. Then repeat the process. It is important to give this break in between cold applications. Although you may be tempted to drain these types of injuries, you shouldn’t. Never drain the bump yourself, unless a vet is instructing you to do so. Often vets will not even want to drain the hematoma. If draining is an option, vets will do it being careful not to infect the area with bacteria from the environment. Most vets like to leave the hematoma alone because of the high risk for infections from bacteria. You must have a drain in the hematoma and you must continuously flush the area clean. When a hematoma heals on its own, the area where it was present may look quite different. Deformation is common, however it can often be avoided with treatment from the veterinarian. Massage therapy is also quite helpful in avoiding scars. Read the next horse health tips article on Emergency First Aid.